Electronic gaming and gamification is a huge and rapidly growing industry that has the potential to help solve the environmental problems we face. Gaming involves specialized applications, whereas ecologically focused gamification transposes game mechanics and game design techniques to engage a wide audience and motivate people to act. Games and gamification can also disseminate critical information focused on climate, the environment and sustainability. The focus of ecological gamification runs the gamut from entertainment that raises awareness to educational efforts surrounding the complex interrelated web of sustainability. The potential of gamification to inform and augur change is huge. The recent viral popularity of Pokémon GO speaks to the widespread interest in electronic gaming. An Ecobusiness article said that such games show that, "it is possible to get millions of tech-savvy people out of their living rooms and basements and actively engaging with the wider world." A recent Nature article suggests that the same kind of augmented reality we see in Pokémon Go can even help to uncover new species. In the U.S. alone, there are almost ten million active Pokémon GO users every day. Gaming has been embraced by a very wide diversity of people from all walks of life. According to "Essential Facts about the Computer and Video Game Industry, 2015," there are 155 million Americans who regularly play video games. A total of 42 percent of Americans play for at least three hours per week and four out of five American households contain a device used to play video games. Such games are now an interactive experience with frequent players saying they spend 6.5 hours per week playing with others. In 2014, consumers spent $22.41 billion on games. The Pokémon GO phenomenon as well as other popular games have significantly increased Nintendo's market value, which is currently almost $40 billion. Gaming is part of the cultural vernacular of our age as explained by ESA president and CEO Michael Gallagher, "Video games are ingrained in our culture". A diverse global audience is flocking to gaming for its entertainment value, and this interest is also being leveraged for pedagogical purposes. The interest in gaming makes the gamification of ecological issues an ideal platform to advance interest, foster understanding and motivate action. Gamification can help overcome some of the obstacles that hinder popular support for ecological action. This includes eco-detachment, the fear and concomitant avoidance associated with climate change and the perception of sustainability as complex and boring. One of the most important things that a game can do is instill interest. A series of children's games called Lizard Island teaches children about ecology and science. The game is interspersed with facts and pop up questions about plants or animals. A Grist article by Amelia Urry reviewed a geophysical video game called Earth Primer, that she described as "a climate change game you’d actually want to play." This is a science based game focusing on the geological forces that shape the Earth. The game enables players to see in seconds what would normally take place over millennia. Users can alter the temperature, sea level, wind speed and rainfalls to see how small shifts have broad impacts. "If young kids end up playing with this and then, as they grow older, they have deep in their consciousness this memory of melting glaciers — maybe that will make them see the world differently." 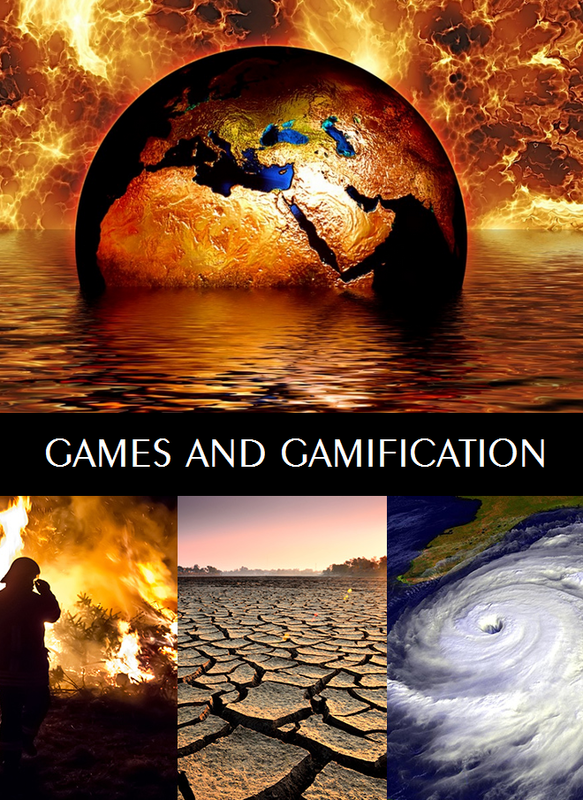 Through gamification we can also render often intangible subjects like climate change in a tangible fashion. "I think that, for me, the toy quality is there to draw you in, and to transform the world into something you can grasp, both metaphorically and literally — that you can literally grasp by playing with it and you can also grasp it conceptually," Gingold said. As explained by Urry, "if we can better grasp the way things used to be, we can really get properly terrified at the scope and speed of the change occurring on the surface of the Earth now, and maybe fix it." Gamification has been used for ecological purposes for many years. We have already seen tremendous interest in ecologically oriented apps. In 2012, there were already a number of such applications and as of 2016, eco-apps continue to evolve in terms of both their reach and their utility. As reported by Triple Pundit, a 2011 gamification effort was launched to make sustainability and renewable energy more fun. The Facebook based game called Solar Discovery was developed by Sunpower and it integrates social networking and gaming to teach people about solar power. They enticed people to participate with prizes including a $25,000 home solar installation plus more than 60 randomly drawn prizes. Contestants win points and virtual badges by answering a series of questions. They are also given access to the right responses when they don't know the answer. In 2012, an interactive game based on system dynamics was released, titled Game Change Rio. Another ecologically oriented gamification initiative called Aqua Republica was launched in 2013 during World Water Week. This interactive game raises awareness about water issues. Gamification can also be used for green event planning. In 2014, Grist offered an example of the latter. They introduced a game called the Grist Fantasy Climate Hawk Draft. It is a riff on a fantasy football game played by an estimated 33 million people. In the Grist fantasy game, participants draft a green team composed of an elite lineup of high profile climate activists. In 2014, the Guardian reviewed a sustainability oriented game called Evaluate that simulates some of the real world challenges faced by businesses. In this game, users are tasked to reduce environmental impacts, diminish operational risks and provide value from improved human well being all on a fixed budget. It forces gamers to establish priorities and make strategic decisions that impact water, climate, soil and species diversity. The future of gaming and gamification as it applies to ecological issues and sustainability is limitless. What makes Pokémon GO so powerful and interesting to ecological gamification is the fact that it is a mobile augmented reality (MAR) gaming app in which a veneer of simulated characteristics are overlaid on real world objects. The applicability of MAR gamification for social and environmental causes is explained in a new paper published in the journal Restoration Ecology. It references the popularity of the game known as Ingress and states, "gaming technology can excite people about nature, unlock their inherent biophilia, and highlight the value of ecological restoration in their everyday lives." Ingress has 7 million active players, and has been downloaded by 12 million people since its release in 2012. The Ecobusiness article suggests that by using the same principles as Pokémon GO or Ingress, we can develop a new game using augmented reality to visualize environmental changes, either good (restoration) or bad (damage), in people’s local landscapes. "Systems Thinking is a core competency for sustainability professionals. As agents of change, we need to understand the shift that humankind is making, from reductionist, rational, linear thinking to systems thinking." Cooper goes on to explains: "Understanding systems allows us to find key leverage points for effective change." Cooper said her gaming session based on the book "The Systems Thinking Playbook" enabled her to make "connections to sustainable habits, climate change, and energy systems. We left with new insights and a starting point for learning and sharing systems thinking. And – we had fun!" In March of this year, The Systems Thinking Playbook for Climate Change was released. It is a short version of the total playbook with games that help people to understand systems and climate change. It is perhaps the best available example of gamification as it applies to climate change. We need to find new ways of reaching people because traditional communications channels are not resonating on the required scale. While gamification may not be a panacea, it may represent our best hope of reaching large numbers of people from diverse walks of life and even more importantly, motivating them to act.